Brilliant brain surgeon, professor and grandson of mad scientist Dr. Victor Von Frankenstein. Frederick’s faithful, bright-eyed, eager servant and friend with a hunchback. Frederick’s young assistant. Attractive and a resident of Transylvania. Must be TALL and must be able to yodel. Stern housekeeper of the Frankenstein estate and former lover of Victor Frankenstein. The head of police in Transylvania. Driven by justice, with a wooden arm and leg. A lonely, blind town hermit, hoping for a friend. Accent: profiecient in monster sounds in an RP accent. The misunderstood creation of Dr. Frankenstein. Gravediggers, Villagers, Medical Students, Passengers, Mad Scientists and supporting roles. Must be strong dancers. 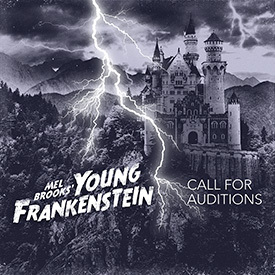 Young Frankenstein is a Cape Town based production and we are only considering artists who are able to consider themselves Cape Town based, at this stage. Should an artist from elsewhere wish to be considered, they do this in full knowledge of the home city, and should their audition be successful, they will be contracted accordingly. So how do you secure an audition? The deadline for submissions is Wednesday 13 February 2019. Simple right? …. I know we are brilliant theatre scientists!